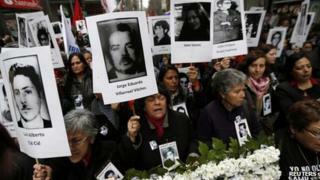 The authorities in Chile have arrested four ex-army officers for allegedly poisoning prisoners during the military government of Augusto Pinochet. The men are accused of murdering two inmates and attempting to murder five more by adding a deadly poison, botulinum toxin, to their prison food. They were allegedly testing a method of killing opponents of Mr Pinochet. The four suspects are already being investigated in the death of ex-Chilean President Eduardo Frei Montalva. He died in 1982 after going into hospital for what should have been a routine operation. Recent investigations however suggested he might have been poisoned. Two of the accused in the latest case - retired general Eduardo Arriagada, a doctor, and retired colonel Sergio Rosende, a veterinarian - worked in a laboratory run by the National Intelligence Directorate, or DINA, Mr Pinochet's secret police force. Retired colonel Joaquin Larrain and retired army commander Jaime Fuenzalida were charged as accomplices. The seven prisoners fell ill in December 1981 in a jail in the Chilean capital, Santiago. They were diagnosed at the time as having acute gastritis. But they showed the effects of serious poisoning from botulinum toxin, according to a statement released by the judicial authorities on Friday, such as "nausea and vomiting, acute mydriasis, difficulty in speaking... and a dry mouth". Two of the men died while the other five survived. More than 3,000 opponents of the Pinochet government were killed or disappeared during his 17 years in power from 1973 to 1990, and about 40,000 were tortured, some of them with poison.